AMD's most recent 45nm Athlon II processor just graduated from dual, to quad core. The AMD Athlon II X4 620 is a 2.6 GHz socket AM3 chip destined for mainstream PCs; could it be the darling CPU option for those on a budget? One thing's for certain, there couldn't be a better chip to land in the midst of global belt-tightening, especially as the quad-core Athlon II X4 620 retails for just $99 bucks. There isn't another quad-core processor on the market offering so much value. Add to that mix the flexible AMD 785G platform which accommodates DDR2 or DDR3 memory, along with its fine-for-destop-applications-Radeon HD 4200 IGP and you've got the building blocks for a truely inexpensive Windows 7 PC that can hold its own. The 95W TDP Athlon II X4 620 processor is based on AMD's 'Propus' core which is architecturally identical to 'Deneb', the backbone of the Phenom II. The difference is that 'Propus' lacks L3 cache while 'Deneb' has 6MB L3 cache. What the Athlon II X4 620 does have are four independent processor cores each clocked at 2.6GHz with 512KB of speedy L2 cache (2MB total). The chip supports HyperTransport 3 at 4GHz, and can be installed into socket AM2+ and socket AM3 motherboards. The processor is manufactured on the 45nm SOI process at Global Foundries Fab 1 module 1 in Dresden, Germany. Of course, a quad-core 2.6GHz chip without any L3 cache can't compete against AMD's Phenom II X4 965 BE or Intel's Core i7 920 processor. L3 cache has its advantages... For the price, the Athlon II X4 620 performs remarkably good in many benchmarks under Windows 7 and Windows Vista, as you'll see later in this review. While it can be said that dual-core processors improve desktop performance universally, four cores have typically been reserved for power users who need parallel cores for video creation, 3D rendering, number crunching and applications of the rendering sort. For standard office applications that support multi-core processors, a quad-core chip can help, but I think in this case one really needs to consider the entire AMD Athlon II X4 620 and AMD 785G motherboard platform as a whole instead of getting fixated on the number four. In the context of a Windows 7 PC that means DirectX 10.1 compliance, High Definition post processing (care of Radeon HD 4200 IGP) and a bit of a choice in DDR2 or DDR3 memory. Like all of AMD's processors, the Athlon II X4 620 has an on-board memory controller that can communicate with dual channel DDR2 or DDR3 system memory at speeds of DDR2-1066 or DDR3-1333. This also means the Athlon II X4 620 is natively a socket AM3 processor but it can be installed into socket AM2+ motherboards without any problem (or at worst a BIOS upgrade). It's this backwards compatibility that continues to make the AMD platform a very cost-effective and easily upgraded PC. The AMD Athlon II processor and AMD's 785G chipset are both fully ready for Microsoft Windows 7 operating system. In fact, the AMD 'Dragon' platform is positioning itself as an economical mainstream solution for Windows 7 PCs. Windows 7 is moderately more demanding than Vista, requiring at least a 1GHz processor, 1GB of memory and DirectX 9 compatible graphics solution with WDDM 1.0. As you would expect, the Athlon II X4 620 processor supports full hardware virtualization, allowing a single core to run a copy of Windows XP inside of Microsoft Windows 7. Virtualized Windows XP will be especially practical when it comes to legacy software applications that don't run in Windows 7. 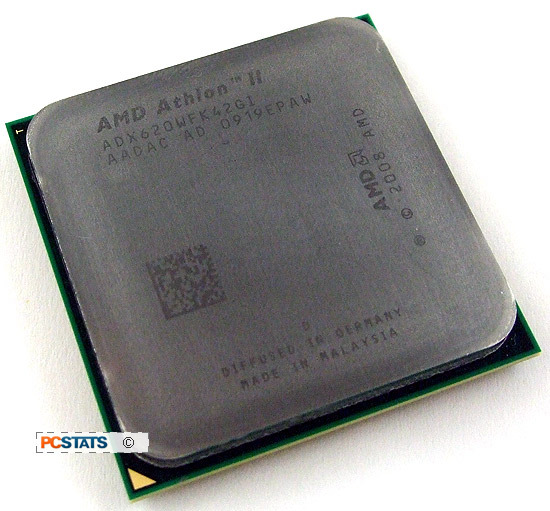 The Athlon II is also the first CPU to move C1E low power states out of the BIOS and onto the CPU. As the Athlon II X4 620 is priced at a mere $107 CDN ($99 USD, £60 GBP), there's no way to get a quad-core processor for less money right now. This means its closest priced competition will be coming from triple core processors like the Phenom II X3 720, and some of Intel's Core 2 Duo processors. Will the four cores of the Athlon II X4 620 give it the performance edge needed to emerge at the top of the heap, or will a lack of L3 cache cripple this processor? The Athlon II X4 620 is built with AMD's "Propus" die, essentially a slimmed-down version of the "Deneb" die that's been around since first 45nm Phenom II processor. 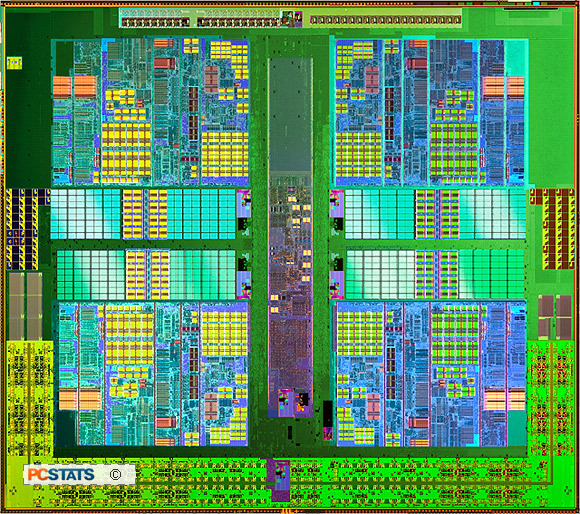 AMD's 'Propus' core consists of four individual computational cores with 512KB of L2 cache each, but unlike "Deneb" it has no L3 cache. 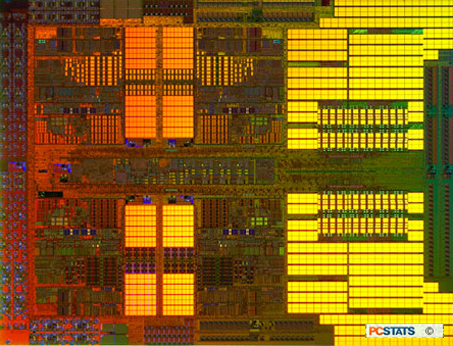 Consequently, the Athlon II X4 620 die is just 169mm2 in size, and consists of a conservative ~300 million transistors. Having no L3 cache has a few consequences for the Athlon II X4 620 processor. A large, fast L3 cache is important for communication between processor cores and multi-threading efficiency after all. When all four cores are busy processing threads, the L3 cache acts as a pool that feeds the individual L2 caches. Ultimately this reduces the frequency that the processor has to fetch information from system memory (your DDR2/DDR3 sticks) or virtual memory (your hard drive), both of which are orders of magnitude slower than accessing on-die cache. In applications that rely on streaming a lot of data into all four cores (like WinRAR) from memory, the lack of L3 cache haunts the AMD Athlon II X4 620 processor like a lead brick. PCSTATS will be testing this out a little later on in this article with benchmarks that illustrate the point. Removing the L3 cache also has the pleasant side effect of cutting the power and heat produced by the Athlon II X4 620 down to around 95W, a significant reduction from the Phenom II's 130W thermal envelope. Above you can see the AMD "Deneb" die that's used in processors like the AMD Phenom II X4 965 black Edition. The golden areas on the right are the L3 cache. This is the Athlon II X4 620 "Propus" die. The L3 cache has been removed, cutting down die size and reducing the processors power requirements and heat output. While AMD has assured that all Athlon II X4 620 processors are based on this new "Propus" die, the company has stated that certain AMD Athlon II X4 630 processors are still based on the "Deneb" die, and simply have disabled L3 cache. Looking at the current line up of AMD Athlon II processors reveals a trend in pricing that anyone on a budget will appreciate. The Athlon II X4 620 is ~$10 more than the Athlon II X2 250, and both processors are compatible with a huge range of socket AM2, AM2+ and AM3 motherboards. While PCSTATS is still expecting the faster-clocks of the AMD Athlon II X2 250 processor to give it a bit of a lead in single-threaded applications, how the extra cores of the Athlon II X4 620 will offset its lack of L3 cache is the question of the day. Moving on, the power meter is hooked up and ready to measure, so let's take a look at how much juice a PC system built with a quad-core Athlon II processor actually draws.